The leopard cat has one of the widest spread ranges of the Asian wild cats, inhabiting most of Asia and several islands. Adult size varies according to subspecies and region, but leopard cats are generally 60 to 90 cm in head and body length, with a tail length of 28 to 37 cm. Shoulder height is generally 20 to 45 cm, and body mass is usually between 4 and 17 lb. Coloration also varies throughout the leopard cat's range, but its color tends to be yellowish-brown in southern parts and grayish-brown more towards the north. Generally, leopard cats have dark spots on their bodies and tails, stripes running down the back of the head, and rings on the tail toward the tip. The Iriomote cat subspecies has a brown coat, and it reaches about two feet in head and body length. Its tail and legs are short compared to its body size. The Indian leopard cat is one of the smaller subspecies and has a shorter coat than its northern relatives. Leopard cats are excellent swimmers and tree climbers. Because of its wide range, this species is found in a variety of habitats, but there is usually a reliable water source needed nearby. Generally, leopard cats are found in forested or wooded areas, often spilling out to cover adjoining scrub and grasslands. Some leopard cats have been known to thrive in agricultural areas such as coffee plantations. Leopard cats are believed to be noctornal, but diurnal activity has been observed. They are solitary and prefer to sleep in small caves or hollow trees. Diet consists of small mammals, such as rodents and hares, small reptiles, insects, fish, and carrion. Leopard cats breed year-round, and females give birth to one to four kittens after a gestation period of 65 to 70 days. Two of the eleven known subspecies of leopard cat are listed as endangered: The Iriomote cat (Prionailurus bengalensis iriomotensis), found only on the Japanese island of Iriomote, and the Indian leopard cat (Prionailurus bengalensis bengalensis), found in India, Bangladesh, Yunnan, and throughout the southeastern Asian mainland. There are believed to be less than 100 Iriomote cats left in the wild. Indian leopard cat population estimates are currently unavailable. The main cause of decline is hunting for its fur. 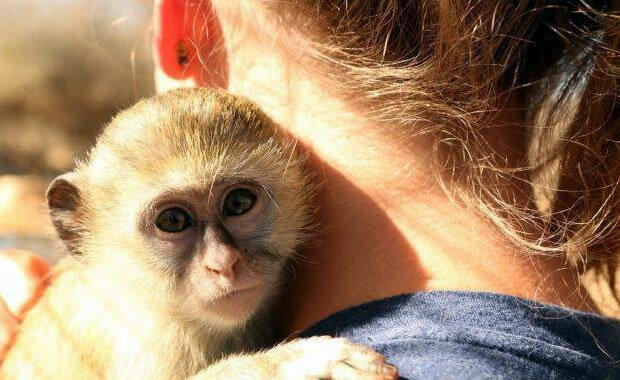 Hunting is now prohibited in many countries, and to safeguard wild populations, captive breeding programs have been developed for some island populations. Copyright Notice: This article is licensed under the GNU Free Documentation License. It uses material from the Wikipedia article "Leopard cat". Glenn, C. R. 2006. 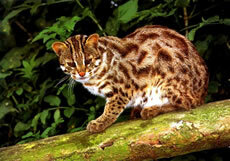 "Earth's Endangered Creatures - Asian Leopard Cat Facts" (Online). Accessed 4/20/2019 at http://earthsendangered.com/profile.asp?sp=62&ID=3. Need more Asian Leopard Cat facts?